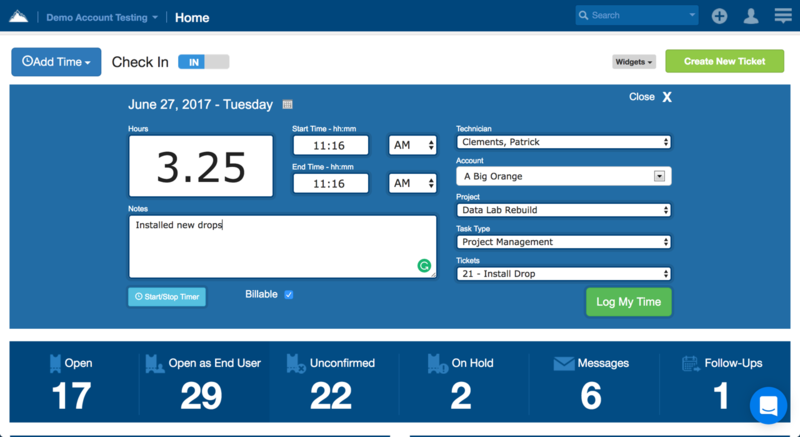 SherpaDesk Time Tracking Solution for Teams. Free Trial. 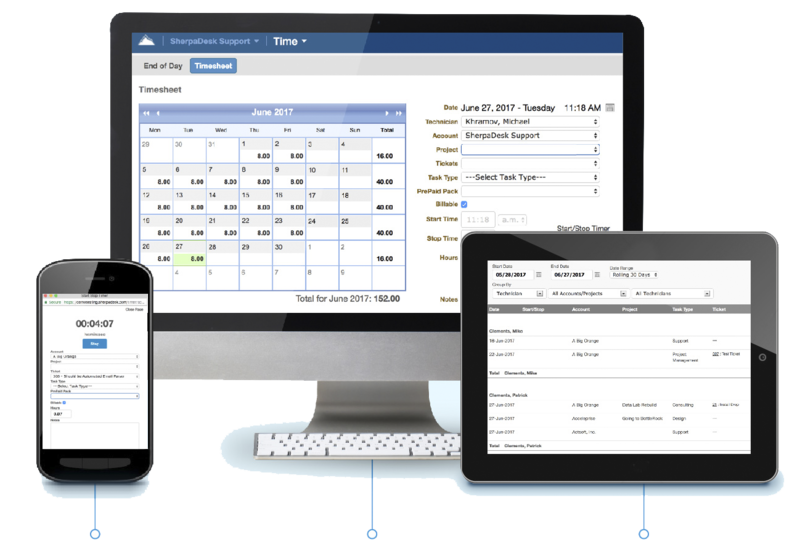 SherpaDesk time tracking solution is the easiest way to capture billable and non-billable time. Multiple ways to capture time ensures nothing falls through the cracks. Time is your product and your most precious resource. Recording the time you spend (whether at your desk, in the field, or a home) is essential to your profitability and growth. SherpaDesk gives you the ability to track time on your accounts, support issues, projects, or assets. Using the convenient Chrome extension, you can capture time when you work outside of the SherpaDesk platform, too. It’s a crowd favorite! SherpaDesk time tracking allows employees to quickly and easily track time against projects, assets, support issues, accounts, and more, from any device! Want to get paid for answering emails? We can help with that, too. Simply enter a command to capture the time you spend responding to support issues via email, and have it queued up for invoicing. Neat, huh? I need to take care of my customers, I need to track whenever they call me or send me email requests and track time spent for assistance. SherpaDesk is a perfect blend of speed/ease of use/price/flexibility for a company like us. With the SherpaDesk stopwatch, starting, stopping, taking a break, switching tasks, and submitting time is always a click away. Track your time and take care of business — withour headaches. Get a birdseye calendar view of all the time spent on an account or project, or per technician. Determine whether each logged hour is billable or non-billable. Get visibility into all logs created for any period. Run reports on accounts, technicians, projects, priorities or tasks. Easily identify the status of logged time, including what is marked as billable, non-billable, invoiced or paid. If your workforce is always on the move or based in multiple locations, it’s hard to know who is doing what (or for how long). SherpaDesk helps eliminate this issue by sending you a daily email summarizing each of your team member's hours and projects for the day. Employee time automatically appears on your time log report and in a queued-up invoice. With one-click integration you can transfer time data directly into your accounting package to save you hours each week and thousands each year!